I dislike Halloween. If my son weren't so darn cute in costumes I'd probably forget the holiday all together. I just can't get into it. I much prefer Thanksgiving. Counting our blessings, visiting family, watching football, eating ridiculous amounts of good food...that is a holiday I can really get behind. It should be no surprise, then, that when fall rolls around in my house I skip straight to the Thanksgiving decorations. To be fair, by 'Thanksgiving decorations' I mean a fairly small collection of pumpkins (including my popular pumpkin place card holders I shared last year). Reminded of my apparent obsession with pumpkins again this year, I thought my decorations could use a bit more variety. 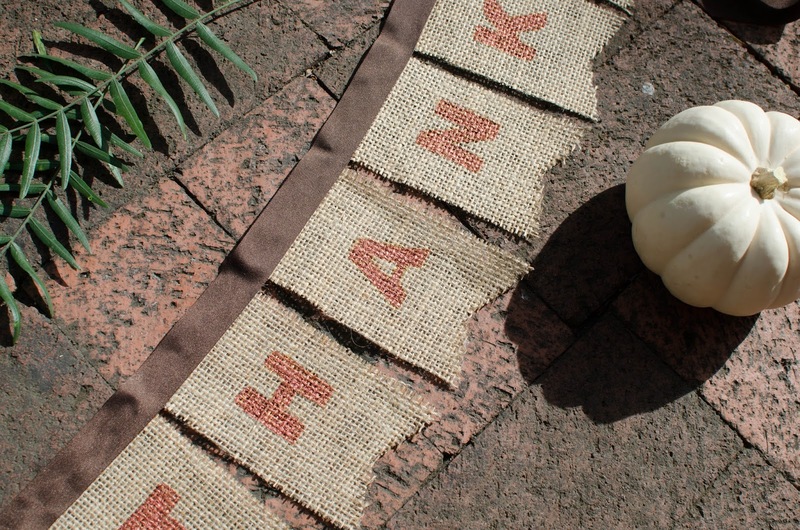 So, with the burlap left over from this project, I set out to diy a simple banner reminding me to give thanks. In the midst of what has turned out to be a fairly tough year for me, I am trying to cultivate a thankful heart instead of one too focused on the trials of late. The Lord has blessed me immensely in many ways and I am excited to be reminded of that every time I look at my banner. Start by ironing the burlap. 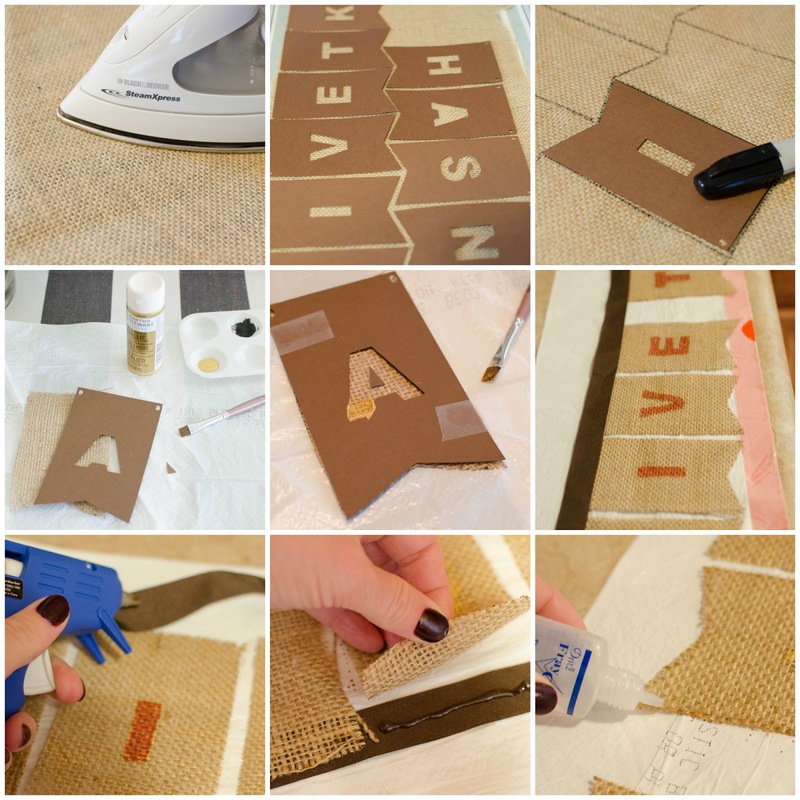 Then use a template or stencil for the banner flags to trace the outline onto the burlap as a cutting guide. Cut all the flags. Next prepare your letter stencils. I used my silhouette cameo to cut the letter stencils directly onto the banner flag templates, but separate letter stencils would also work. 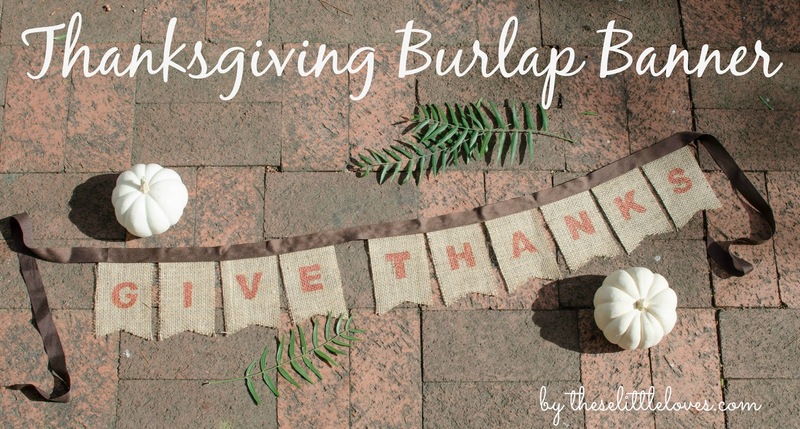 Tape the stencil over the cut burlap flag and dab the paint onto the burlap. If there are any middle pieces for the letter (like in the 'A' below), I usually try to stick them down with a small amount of tape before painting. Ignore the paint color in the stencil pictures - I started out with a lighter gold, but found that it was too light against the burlap so I switched instead to the Rust color. Once all the letters are dry, it is time to attach it to the ribbon. Lay your ribbon down (right side down) as a guide. 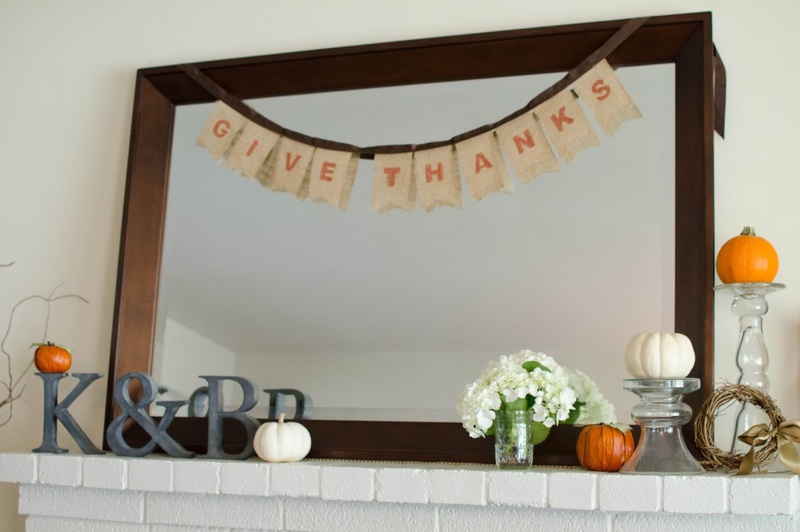 Place each letter (also right side down) onto the ribbon and adjust them to the final spacing. Then use a hot glue gun to adhere the burlap to the ribbon. Burlap frays quite a bit so I added a generous amount of Fray Check to the border of each flag. Once the hot glue and fray check are dry you are ready to hang your banner! And here it is as part of my mantel decorations.